Absolutely great part for hookah lovers and also for beginners who now dare to build a shisha. Through the two handles, the glowing coal can be brought straight to the shisha without burning your fingers. Super thought and all advantages exploited. Absolutely great part for hookah lovers and also for beginners who now dare to build a shisha. 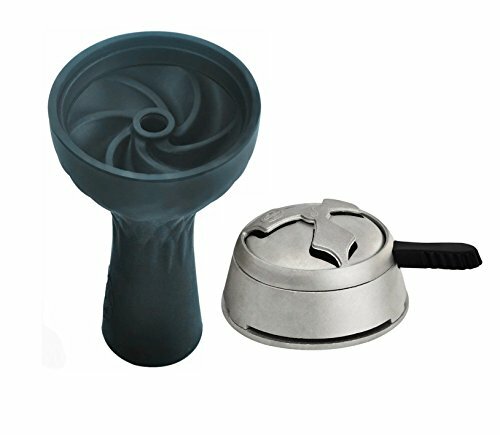 Easy to clean, fits perfectly on the hookah and does not give off any taste of its own. The smoke is good and with a thin aluminum foil layer between the head and the top the tobacco does not burn. The attachment is super handy with the handle that does not get hot! The material makes it portable and completely heat-resistant. No odor and no taste in smoking. Very high quality and keeps forever, both parts fit together perfectly and with the rubber grip it is removable even when hot without burning his fingers the best but thanks to him has my smoke taste and the smoke. He can be cleaned really well and of course does not break down when falling! If you have any questions about this product by Namee, contact us by completing and submitting the form below. If you are looking for a specif part number, please include it with your message.